Bringing desktop graphics to laptops with plug-and-play convenience, the highly-anticipated AORUS GTX 1070 Gaming Box is a true plug-and-play external graphics solution that was unveiled earlier at COMPUTEX 2017 with much attention received for its innovative design and affordability. Pre-installed with a high-end GeForce® GTX 1070 graphics card, the device can easily transform any Thunderbolt™ 3-enabled laptop into a powerful gaming battle station. Unlike most conventional external graphics enclosures that come with an empty dock, the AORUS GTX 1070 Gaming Box is a complete package with a factory-overclocked GTX 1070 graphics card already built inside, requiring no extra hassle or cost to put together an accommodating graphics card separately. Thanks to the Thunderbolt™ 3 connectivity, the device is able to provide a significant graphics boost to laptops with a blazing-fast data transfer speed of 40Gbps, while delivering up to 100W of power to the connected laptop at the same time with the embedded 450W PSU. The Thunderbolt™ 3 plug-and-play support also allows for quick, easy connections without having to reboot the PC. The AORUS GTX 1070 Gaming Box also provides a more compact solution compared to other external graphics alternatives with its small form factor, which takes up very little space and can be easily stored or carried on the go with the included carrying bag, enhancing the device with better portability. On the side of the chassis, there is customizable color lighting powered by RGB Fusion. In addition to the graphics performance upgrade, the AORUS GTX 1070 Gaming Box acts as a docking station. Aside from the HDMI, DisplayPort, and two dual-link DVI outputs to pair with single or multiple external monitors, the device also has a collection of three USB 3.0 ports available at the back for connecting peripherals or external storage for an enhanced user experience. There is also an extra Quick Charge 3.0 port that allows for personal mobile device charging at up to 4 times the speed of a conventional charger. 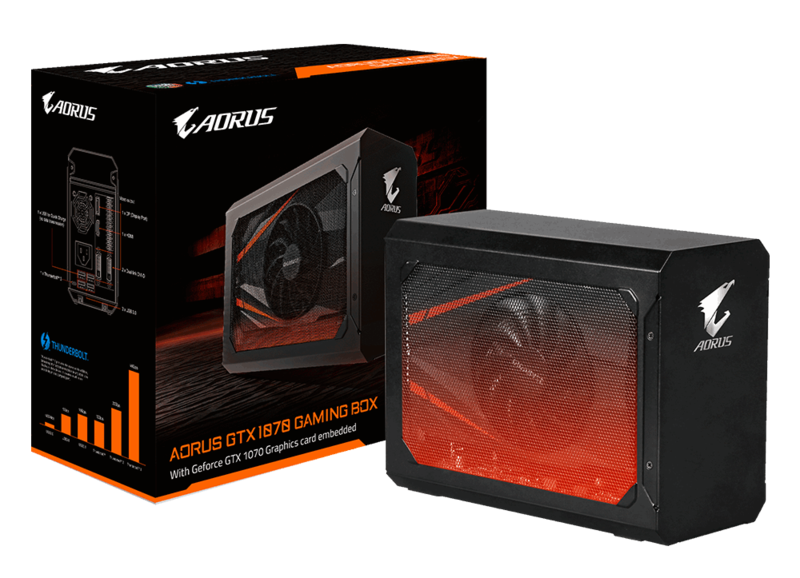 Click here for learn more about the AORUS GTX 1070 Gaming Box.